4 out of 4 wins for EUBC! A strong win for M1 last Wednesday against Aberdeen University. Both teams had started slowly with plenty of missed baskets. Aberdeen had success inside the paint whereas Edinburgh found their points from mid range. The score by the end of the first quarter was 19-19.With Aberdeen still successfully finding points we switched to a full court press, with many turnovers from Aberdeen, M1 managed to finish the half with a 12 point lead. Aberdeen came out with high intensity in order to make up the gap. M1 switched back to 3-2 defensive zone, with defensive rotations failing Aberdeen almost caught up. Edinburgh was up by 4 by the end of the 3rd quarter. With the tight score both teams tried to push their scores. The high intensity lead to many fouls, but Edinburgh managed to keep the lead by ~2-6 points. In the final minute Edinburgh were leading by 4 points but with successful shooting from Aberdeen the game tuned into a past pace race to score. Edinburgh won 67-64. A must win game vs St. Andrews for W1 last Wednesday. W1 had beaten them before by a margin of 50 so they were expected to win but nevertheless they needed to make sure to get the position in the rankings they were are aiming for. As most of the players have a lot of big games coming up and many hours of traveling W1 needed to manage them well. A couple of minor injuries made W1 sit out a few players so they started the game with 7 players. After a slow start from missing the first few opportunities, W1 started to really push the ball in transition and shared it really well. Solid man to man defence made St. Andrews take difficult shot under pressure from the shot clock that they then rebounded and most of the time turned into a made basket for them within 4 seconds. St. Andrews executed their plays very well, credit to the coach but most of the time, they were not capable of getting a good look at the basket. After 5-28 it was 7-60 at half time. 10-90 after 3 quarters and finally 17-113. Top scoring were Dori Lansbach with 30, Natalie Bastian with 24, Beth Mackie 19, Tricia Oakes 18, Sarah Thomson 15. Next week the final game of the competition versus Newcastle for the 4th spot in the rankings. Men’s 2nds pick up where they left off last semester with another win, beating a strong St Andrews side 68-53 away from home. Yet again the Edinburgh side benefited from their strong depth with all 12 players making meaningful contributions on the court. First year Edward Agboraw continues to impress, scoring a game high 20 points while also leading the game in rebounds and blocks with his relentless effort. The team now prepares the host Edinburgh Napier at home in two weeks time in what should be a competitive match as the team looks to remain at the top of their league. Good win for the W2s away against Aberdeen 1sts this Wednesday. The W2s started strong getting ahead to a 6-2 lead but a number of poor passes and turnovers kept Aberdeen in the game, with only 1 point down by half time. The girls refocused and started to pull away in the 3rd quarter with stronger defence and a more cohesive offence. Aberdeen struggled to score against our full court press and their switch to a zone gave us easy 3 point shots from the whole team. The final score was 29-54 to Edinburgh. Top scorer was Cara Targett-Ness with 15 points. Next week, the girls will take on Dundee University in CSE at 1.20pm. W1 started with a slow start for but were able to pull away slowly in the first quarter to end it at 16-5. The team decided to work on some of their tactical stuff and but made some mistakes executing our presses. The opponents used those opportunities very well and made 8 points by smartly countering the girls pressure. Slowly they were climbing back in it when the scoreboard showed 24-16 but then it was over for St. Andrews who went with only 2 points in 16 minutes of game play. The team steadily kept going and pulled away. The game ended with 76-23 on the board. A good win without playing great basketball. Sarah Thomson played her first official game after having been out for about ten weeks. She managed to score 4 points but also grab 11 rebounds in about ten minutes of playing time. Hannah Robb and Hannah Peacock also came back from an injury and played small minutes contributing 6 and 8 points to the win. It was a tough away game for the M1’s who came up short in today’s fixture against Sheffield Hallam university. The first quarter was very much a tight affair with defence prevailing over offence on both sides. This was reflected on the score board with the men trailing 13-11 entering the second period. The game followed a similar path in the second stanza with neither team able to put a run on the other. Cameron O’Donnell – who joined the side due to a severe lack of players making the trip- undoubtedly came up with one of the highlights of the game with a 2 handed slam on the fast break. Despite this, the university lost the period by 5 and entered the half down 31-24. With the players suffering from fatigue, Sheffield were able to capitalise on the lack of depth within Edinburgh’s side. Strong ball movement paired with an influx of made 3 pointers from the hosts resulted in the game opening up ad the score stretching to eventually finish 69-44 to the hosts. It is disappointing as with a full team the game was certainly winnable- indeed, Edinburgh may well have been favourites. Nevertheless, it was a great effort from the guys on the day. M2s beat Stirling M1s at home on Wednesday 70-61. After a slow start that saw the team down 4 after 10 minutes the Edinburgh side stuck to their game plan and won each of the last 3 quarters. The coaches feel that this was the teams most balanced game all season with 10 players scoring. First years Shawn Schneidereit and Alexander Boggon both had their best games since joining the university team and it was their combined efforts to start the second half that helped spark Edinburgh’s run. The team would like to thank Matt Young and Oliver Schmidt, players who are leaving at the end of the semester. Their passion and strong play has helped the M2s finish the semester at the top of their league and while their contributions will be missed the coaches and team are eager to continue to improve and finish the season in the same position. Good win for M3, they started off very well playing intense defense and took an early 15-point lead in the beginning of the first quarter. The lead never went below 10 points after that. Edinburgh college made many come back attempts but a big game from Pengfei Li where he hit a team high 3 three pointers in the second quarter kept them at bay. EUBC managed to maintain an aggressive approach, continuously attacking the basket and going to the line many times in order to secure the win. Final score was 79-61. It was an easy win for Men’s firsts against Strathclyde University, 72-35. It took a while for the team to get in to the game. They started off rough but soon, the team worked together, moved the ball really well and had a strong defence. It was a fairly physical game for both sides, for the first half M1s had a lead of about 8-15 by exploiting the defensive gaps created by their plays. However M1s lead didn’t grew any larger as their offence managed to kick the ball out. Second half ended with a 6-point lead as at the end of the 2nd quarter Strathclyde had a decent run. By 3rd quarter, M1s outclassed them in many aspects and didn’t let Strathclyde get many scoring opportunities. Men’s 2nd’s lost away from home against RGU by a final score of 53-42. An early tip off and long drive meant the team was missing 3 regular starters and coach Dale Gilmour. The shorthanded side played hard to stay in the game but unfortunately were never able to recover from a poor second quarter. Despite the final result, coach Connor Sharp was impressed with his teams continued effort and hustle to stay in the game and was happy with how the younger players all stepped up when given more opportunities. The current league leaders are confident they will learn from this loss and produce a stronger showing next week in their final game of the semester against Stirling University at home. Special shout out must go to first year Sean McDonald who played for his team despite recovering from illness which kept him out of last week’s match. With only 7 players, the W3s played a great game to secure their next win of the season against Napier University 2nds, remaining undefeated in the SSS regional league. The girls ran hard in offence and played aggressive defence, with points coming from all across the team. Overall, was a very solid performance from the girls! Final score was 45-6 to Edinburgh. M3 lost 63-39 to Queen Margaret University. It was a tough game for the team with four starting players out with injury and only one available center. M3s had beaten this team by about 20 points, 2 weeks ago in the cup game so they were disappointed to lose against them now in a league game. However, the game started off well with M3s winning the first quarter, and tied for most of the 2nd quarter. They had a big home crowd who gave them a huge boost. Unfortunately, the other team out rebounded their undersized team and played much better as a unit. There was only one referee which led to many arguments, and a lot of controversial calls. In the end the head coach, Jorge Maicas said there was a lack of team cohesion as the reason for their loss. W1 had a tough game against Newcastle University but came out of it with a win. The team of only 6 won in overtime after having to come back twice. The 75-74 win vs Newcastle was the first win of the season and a real accomplishment. Everybody contributed and worked as a team and this really paid off. After a slow scoring start but with great defence, the team ended the first quarter with a small margin 15-13. In the second quarter W1 shared the ball very well end shot it at a very high percentage. After making 9 of 16 3 point attempts before halftime, they lead 43-32. The second half was poor, with them struggling to make shots and Newcastle slowly took the lead. Being down 61-66 with not much on the clock everyone gave it all they had and managed to make the last 5 points. The game went into overtime! Newcastle got a head start as W1 let them get a 4-point advantage, 67-71. Head Coach, Bart Sengers, took a timeout to make sure they were all on the same page again and they were. W1 took control defensively and managed to score. 74-74 with 10 seconds to play, Newcastle had the ball to try to win it. Captain, Robyn Lewis waited till the last seconds before attacking the basket fearless. She got fouled and was rewarded with two free throws. She made the second and with 2.1 seconds on the clock there would be a last shot for Newcastle but they couldn’t make it and the signs of relieve were followed by well deserved celebrations. Men’s 2nds remain the only undefeated team in their league following a 63-48 win at home against Dundee University 1sts. Following their elimination from cup play last week at the hands of the same Dundee side, however, M2 worked hard to ensure a better outcome this time around. Following a first quarter that saw M2s down by 1, the team improved throughout winning each subsequent quarters by margins of 3, 5 and 8. The coaches, Dale Gilmour and Connor Sharp credit their victory to their high pressure defence which only allowed 14 points in the second half and the teams rebounding efforts on both ends. M2s benefitted from a balanced scoring effort as a result of their improved ball handling and off ball movement. The Men’s 2nds travel to RGU next week in hopes of continuing their strong play. W2 had a tough defeat this week against Glasgow University, 39-54. This was the girls second time playing Glasgow after taking the win from the first game. Unfortunately, the team was down after not having some of their starting players due to injury and call ups to W1s. However, the team still fought hard with only 7 players. The girls got off to a rough start letting Glasgow get a 10-point advantage by the end of the first quarter. It was only after, that the points didn’t change much between the two teams in the 2nd, 3rd and 4th quarter. W2s played excellent defence and fought strong in their offence but sadly it was not enough to catch up to Glasgow. Head Coach, Jordan Webb comments that the girls need to work on their spacing more. Next week, the girls will be playing away to Napier University. W2s are currently coming 2nd in their league. M3 had an uneventful game against Dundee University. The final score was 63-27 to Edinburgh. M3 had a tough team to beat but did manage to bring the game to within 10 points through the 2nd quarter. After only managing to score 5points in the second half, the ended up playing shorthanded with 3 starters injured. It was a close win for M1 this week against Glasgow University, the final score was 68-60. In the first half, they took the lead thanks to their plays and movement on the court. Glasgow’s defence was tough to play against but fortunately they lost concentration a few times allowing them to score. It was only after half time that Glasgow started to overtake, letting them win the third quarter. However, they fought strong in the last quarter and took the win. They managed to score some good shots, few 3’s and got an 8 point lead to finish the game. Captain, Brendon Mullan comments, “It was a game of runs really, quite back and forwards. There are lots of positives but still a few things we can improve on”. W1 had an unfortunate loss this week against Northumbria. With most of their team injured, they played with only 7 players, 3 of which were from W2. Head coach, Bart Sengers comments, “We had debuts at this level for Rosanna Pollock and Murron Marr. Both of them did well and it is a great learning experience for them.” They managed to win the third quarter, but unfortunately didn’t have enough personnel to keep up with the other team. They took the game as a positive as they managed to score more points this game, as to when they played them two weeks ago. Tough result for the Men’s 2nds who lost to Dundee University in the opening round of the Conference Cup to a score of 68-76. The team’s poor shooting at the free throw line ultimately cost them the game but the coaches were proud of their teams hustle and effort throughout the game. Despite losing starting guard Terry Guo to an early injury and having two other starters foul out, the team still managed the force the game into double overtime. Veteran Nils Andräs led the team in scoring with 21 and American guard Matt Young impressed with his strong shooting and high pressure defence. While disappointed the team is eager to host Dundee again next week as Edinburgh looks to remain at the top of the league in what is sure to be a fun match for both sides. W2 had a tough loss this week against Robert Gordon University. After losing 3 of our top scorers to BUCS prem, the team was still determined to take on RGU. It took them a while to get into the game, making them lose the first two quarters due to some poor spacing. Half time score was 16-28. However, they had a fantastic third quarter, making RGU turn the ball over a lot due to a strong defence. This made them win the quarter, 13-5. Unfortunately, it wasn’t enough to over take them. The final score was 33-44. After an upsetting loss, the girls are looking to fight back strong next week in their game against Glasgow University. It was a strong win today for the Men’s 1st against Abertay, the final score was 86-66. They started off with good offensive play which got them an early lead. It was a tough game for both teams as officials were calling a large number of light fouls However, the men were focused and controlled the pace, resulting in a 10-point lead by the end of the first quarter. In the 2nd quarter, our 1st team struggled in defence, but they still managed to stay ahead, extending their lead to 16 points. By the third quarter, Abertay switched to a zone defence and it took our offence a while to adjust with the lead being reducing by 8-points. In their final quarter, they increased the tempo with a press that forced Abertay into many turnovers, increasing their lead once again. Despite a poor defensive show, the pressure allowed our men’s lead to keep growing, resulting in a 20-point win. Men’s 2nds remain undefeated so far this season with a tough win away from home against a strong Napier University team, beating the home team 59-52. Starting off the 4th quarter down by 3, the team went onto have their highest scoring quarter of the game while their strong defensive effort forced Napier into their lowest scoring quarter of the game. Josh Proctor led by example on the defensive end by playing the full 40 minutes of the game in a successful effort to slow down Napier’s main offensive threat. Captain Andrew Hobson helped the team come from behind by setting the tone early in the 4th quarter with his game changing energy when he entered the game. Special mention must go to Edward Agboraw and Nils Andräs for their dominant rebounding efforts on both ends of the court. Once again every player on the team provided key contributions on the court. The coaches look forward to building on today’s performance as last years Conference Cup Champion’s prepare to host Dundee University next week in their first cup game of the season. It was an easy victory for W2 today. 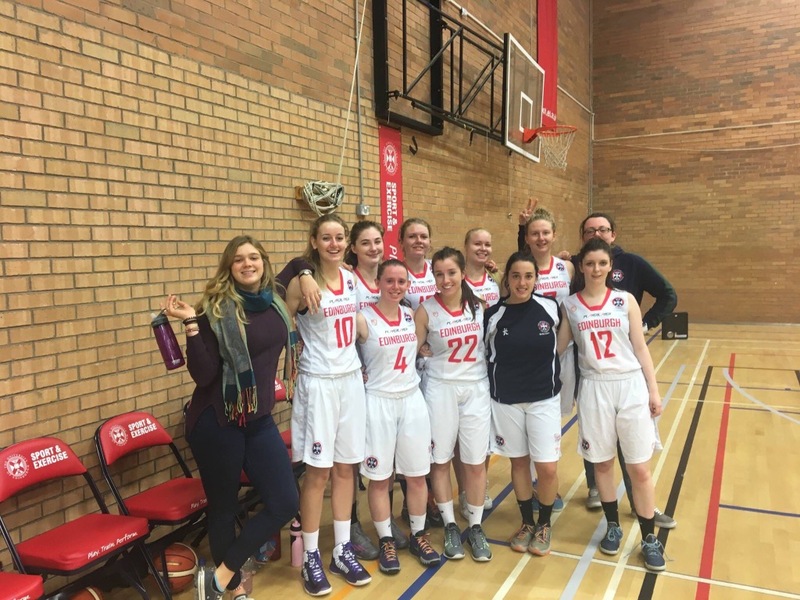 They took on Dundee University and finished with a score of 72-33. Top scorers were Murron Marr (17 points) and Salla Tuomaala (16 points). In the first quarter, they managed to pull quickly away from the home side, creating an 11-point lead at the end of the first quarter. They played well as a team but their defence was pretty poor as it was shown to be a downfall in the third quarter. However, they still managed to get a strong lead winning the game by 39 points. The team says it was not their strongest performance but still happy to come away with a solid win! Another win for the M3s today as they took on St Andrews, final score was 66-57. Top scorer was Julian Vogel with 15 points. He made most of this points in the 4th quarter helping them seal the win. They were down by 8 points in the third quarter after one of the other team players hit 3, three pointers in a row. However, they managed to take the win with their strong defence in 4th quarter. It was a tough week for EUBC last Wednesday in the BUCS league! Another tough battle for the Men’s 1st against Strathclyde university this week. It was a close match and they fought hard but unfortunately couldn’t stay clear of turnovers. However, star player Leonardo Mancini managed to make some big 3’s in the final few minutes of the game but unfortunately this wasn’t enough and Strathclyde took the win by 3 points. Final score 68-65. 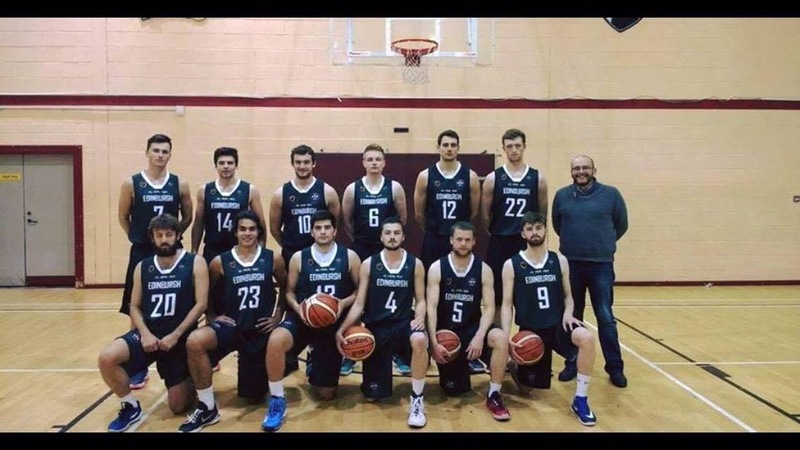 EUBC Kick Start the 16/17 Season With Wins For 5 Squads! What an exciting day last Wednesday, with Edinburgh University Basketball winning 5 out of 5 games! The W2 kicked it off with their game against Glasgow University! This was their first game of the season and they managed to play well as a team, winning every quarter. By half time, W2 were up by 23 with Holly Gordon scoring 5 three-pointers! They continued to fight strong in the second half, and took the win with the final score being 41-62. Our newest team, W3, managed to exceed all expectations in their first time representing EUBC! Playing against West Lothian college, by half time they had an outstanding score of 34-2. In the second half, they managed to not let them score once with them winning 69-2. EUBC are extremely proud and are very excited to see where this team will end up over the next year! Unfortunately, due to timings, M3 game was cancelled but they still managed to play a friendly against Stirling university with them managing to still win by about 40 points. The final score was 64-18. M2 also won 100-81 against Stirling University. It was a close score at half time, 51-47 but they managed to pull away second half. Craig Ferguson stood out throughout the game scoring 27 points, of which 15 of those were from free throws. Anthony Ejidike also finished strong, scoring 12 out of 20 points in the fourth quarter. The coaches said that it was a great effort from the team overall, they managed to really step up in the second half! Last but not least, the M1 had a tough game but managed to pull through and win by 9 in the end. Team rep, Brendan Mullan says that Heriot Watt is a great team and they move the ball fast. It was their first time playing as a team in the BUCS league and they were a bit rusty from this, managing to turn the ball over a lot in the first half. However, they were determined to play together as a team and improved by the end quarter! They still managed to do a great job in representing EUBC. The final score was 54-43.